At the corner of Ariogalos and Linkuvos streets in the Vilijampole district of Kaunas, Lithuania, stands a simple, lone granite memorial to those Jews who perished at the hands of the Nazis in World War II. It stands like a lone sentinel, keeping a 24-hour watch over the souls of the dead. Quietly but determinedly, it commands us to heed its eternal message of remembrance. It was here in this suburban district known to the Jews as Slobodka that on German orders, the Kovno (as Kaunas was once called) Ghetto was sealed on 15 August 1941 with 29,000 impounded people. The area had been a Jewish village for four hundred years. Jewish history runs particularly deep Lithuania. Before the war, some 200 communities across the nation supported the lives and livelihoods of nearly 240,000 people. More than ninety percent perished. Jews are first known to have lived in Kovno as early as 1410 when they were brought forcibly as prisoners of war by the Grand Duke Vytautas. Many of those Jews were later active as traders between Kovno and Danzig (today's Gdansk, Poland). Living conditions for many Jews were squalid. In 1858, archaic living restrictions were relaxed and all but 6,000 of the city's 35,000 Jews flocked to the Old Town in search of something better. In July 1941, however, the Nazis expelled all the Jews from the town and sent them back to Slobodka. 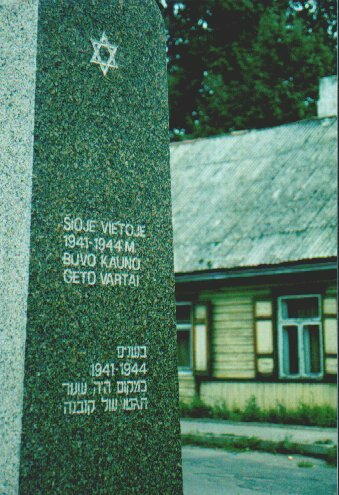 The Kovno Ghetto was thus established. The first pogrom was on 25 June 1941. On 7 July 1941, Avraham Tory noted in his Kovno Ghetto Diary: "Soviet rule has disappeared. The Jews are left behind as fair game; hunting them is not unprofitable, because the houses and courtyards of many of them brim with riches. ŒSlaughter the Jews and take their property' - this was the first slogan of the restored Lithuanian rule..." By October, some 1,800 people were consigned to their deaths in a smaller Ghetto. Like other Ghettos, not all the days were tragic. There were moments of joy betwixt long days of false hope, delivered with fresh supplies of food or bundles of firewood. Avraham wrote in his Diary that some cultural events were, remarkably, maintained, such as a Purim festival and a Passover celebration. On 24 July that year, he wrote that the Zionist party was "a festive occasion, pervaded with splendour." Remarkably, the Ghetto also organised a symphony orchestra, lectures, art classes, discussions, and Yiddish classes for children. Maintaining even a semblance of Jewish life and tradition was as great a statement of resistance as picking up a gun. But that resistance only lasted so long. Following the July 1944 liquidation of the Kovno Ghetto, only a quarter of the Ghetto's original number remained. Men were then transported to Dachau and women to Stuffhof where they met their barbarous fate. Today, not much remains of Kovno but fragments of that old community: derelict buildings, slanting wooden houses, and the wonder of what the place was like, both pre and post war. It is a depressed area. If not for the memorial, today's residents of Vilijampole would apparently be oblivious to the events of fifty-plus years ago. Today's five hundred or so members of the Jewish community are certainly not oblivious of their past. On the back wall of Die Synagogue to the left of the bimah hangs a prominent memorial to the Lithuanian Jewish communities decimated in the Holocaust. The names of those communities which were annihilated are spelled out and presented in tabular form. Whilst appreciating the length of the list, I stood behind a man who bowed his head in silent memory. When a fellow community member took a position next to him, they exchanged a wordless but deep, firm handshake. As it turned out, the first of three evenings I attended services was quite mirthful despite the solemn display of remembrance I had just witnessed. Kaunas has a small though peppery congregation. In the sanctuary of the synagogue, I met an aging but spry group of men (no women were present) I had not expected to meet. The voices of the congregation were particularly boisterous, rising like a star on a Shabbat evening. 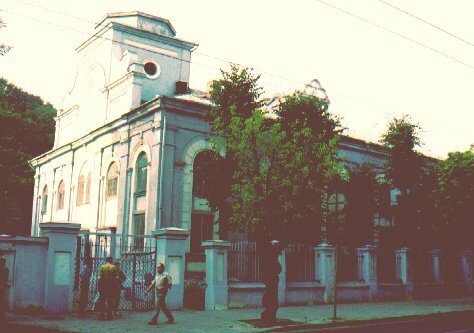 I was also impressed with the synagogue's simple beauty, its stained glass, and grandness, though it appeared somewhat weary from the outside, fatigued by Soviet occupation. Built in 1871, it is today the only remaining synagogue in a city which once had some thirty-six synagogues and prayer houses (the shells of two other synagogues are located in the Old Town). Kaunas' darkest side is IX Fortas, one of a series of forts built by the Russians but later used by the Nazis as a murder factory. 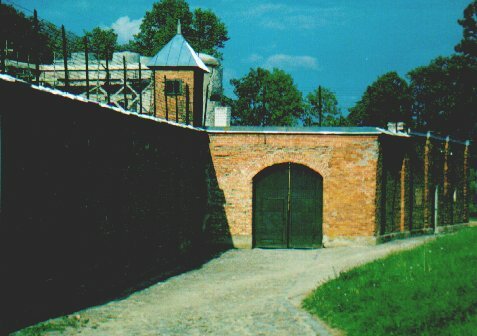 Located in Kaunas' northwest outskirts, the fort failed the Russians in their attempt to defend their western frontier, falling to the Germans in only eleven days of battle. Inside, primitive bedding remains firmly behind double meshed bars covering the windows of the cells. The prison's fortified walls exude a stale coldness, creating an appropriate somber mood for viewing the numerous displays of photographs and reports of the gruesome events which took place here. In addition to the communal cells was the "Health Room", a 3 metre by 1 metre hole beneath a stairwell, and the "Wet Room", a fairly spacious but dank chamber of concrete without a crack of light. I was particularly drawn to an exhibit on Chiune Sugihara, the Japanese diplomat in Kaunas (1939-40) who was personally responsible for issuing 6,000 visas for safe passage out of Lithuania to Japan. For those held captive in the IX Fortas, it was a short shuffle from the front gate down the Path of Death to the Wall of Death, a corner of a moat-like trench where people were lined up as targets and shot. 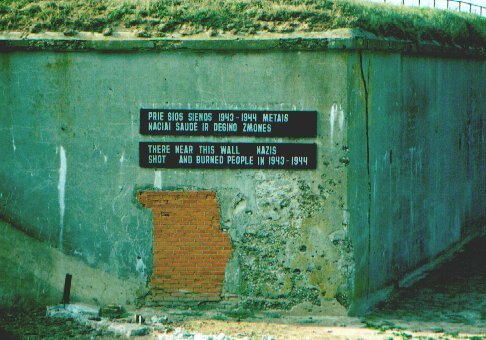 Today, this wall is still riddled with bullet holes and is the fort's starkest reminder of the evil which was perpetrated here. In all, some 80,000 people from Lithuania, Austria, France, and other Nazi occupied areas, were slaughtered at the fort, including most of Kovno's population. Just behind the trench is a field where the dead were discarded. Today, it is a peaceful spread of green backdropped by a new housing development. Adjacent to the field is the leviathan Monument to the Victims of Fascism, a concrete crush of desperate faces rising from the earth in immortal resistance. Behind the synagogue stands a memorial to the 1,800 children who were murdered here. Kaunas became an important centre of Jewish cultural life in the latter half of the 19th century. Distinguished Jewish leaders moved here from Vilnius, the capital, to establish yeshivas. Influential thinkers also moved to Kaunas. When Vilnius was annexed by Poland during he inter-war years, Kaunas became the provisional capital of Lithuania. In 1928, there were 1,000 Jewish students at the Vytautas Magnus University. There was even a Semitic studies program. In 1931, the Jewish Ethnographic Museum was opened. Within only a few years, it had collected some 3,000 Jewish art works and artifacts. By the mid-1930s there were successful Jewish writers, poets, and artists residing in the city. By 1938, the Jewish population was nearly 40,000 and the area was a booming hub for Jewish businessmen, entrepreneurs, artisans, doctors, and lawyers. Five Jewish newspapers were published daily. There were schools for all ages, adult training centres, theatres, libraries, sports clubs, and political groups. Even the Central Jewish Bank of Lithuania was centred in Kaunas. The potent influence the Jewish community had in Kaunas before the war was snuffed out forever but, for their numbers, the vigour of the remaining Jews most certainly rivals that of past communities. I was able to discern that energy when Synagogue President Chatskal Zack zestfully shook my hand on the evening of my third visit, and eagerly invited me back for the following morning's Shabbat service (which I was unable to attend). As I exited, other men standing in the foyer warmly bid me a "Shabbat Shalom", leaving me with the impression that all is peaceful again. At that moment, I realised that those men are the true sentinels of Kovno.